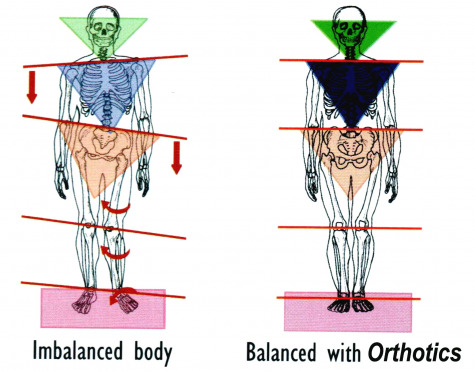 The joints and muscles of the body function most efficiently when they are in physical balance. The body is a biomechanical "kinetic chain" where abnormal movements at one line, or joint, can interfere with proper movements at other joints. During standing and walking, our bodies are subjected to natural forces and postures that can inflict mechanical stress and strain throughout the interrelated chain of joints and muscles. Excessive rotation of the tibia and femur, stressing the knee and twisting the pelvis and spine. Tilting of the pelvis which places tension on muscles and connective tissues, eventually resulting in chronic back problems. High levels of heel-strike shock from breakdown of the body's natural "shock absorbers." The shock wave then transmits up the kinetic chain, resulting in painful symptoms up to the head, slowed recovery of leg and spine injuries, and aggravation of other conditions. Properly fitted orthotics support the foot to control excessive pronation and supination, preventing unwanted stress on the body. Limiting functional hypermobility helps chiropractic adjustments hold longer and increases the effectiveness of care. Use of orthotics represents a long-term, yet cost-effective intervention for many types of functional and structural problems. Wearing orthotics inside shoes is similar to placing a shim beneath the leg of a wobbly table: it adds support to eliminate unwanted motion in the entire structure. The foot is formed of three distinct arches (transverse, medial, lateral), which create an architectural vault. 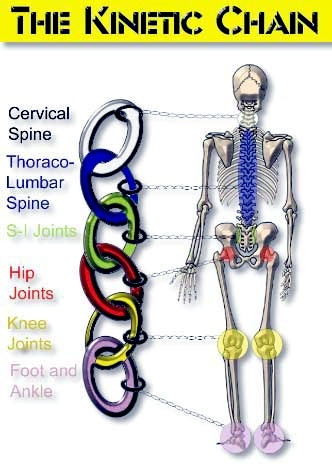 The result of supporting these three arches is improved stability and postural integrity. Orthotics encourage optimal muscle and nerve function by guiding the feet through a more normal pattern with each step taken. Do you participate regularly in any physical sport such as basketball, tennis, golf, etc? Have you had a prior injury to your knee, foot/ankle, back, or neck? Do you have obvious foot problems, such as bunions, corns, flat feet, etc.? If you answered YES to any of the above 10 questions, then custom orthotics could be just right for you!